Arthur Robert Ashe, Jr. (July 10, 1943 – February 6, 1993) was a prominent African American tennis player who was born and raised in Richmond, Virginia. During his playing career, he won three Grand Slam titles. Ashe is also remembered for his efforts to further social causes. The Arthur Ashe Courage Award, an ESPY Award for humanitarian work, is named after him, as is the National Tennis Center in Flushing Meadows, New York, where the U.S. Open tournament is played. The only black male to win the singles title at Wimbledon, the US Open, or Australian Open, Ashe also set a record in 1968, which may never be equaled. He won both the U.S. Amateur and the U.S Open championships, the first and only time such a double win has been accomplished. For twelve years, Ashe was ranked among the world's top ten tennis players. He was ranked number one in both 1968 and 1975. One of the founders of the influential Association of Tennis Professionals (ATP) in 1972, he served as the organization's president and was a highly respected spokesman for the game. Ashe served on numerous corporate boards, wrote books, and received several honorary degrees. Ashe was also a vocal and long-time protester of apartheid in South Africa. After several refusals, he was granted a visa to visit that country in 1973, becoming the first black person to win a title—a doubles match—in the South African Open. Ashe died of complications from AIDS on February 6, 1993, after contracting HIV from a blood transfusion during heart surgery. Ashe was born in Richmond, Virginia. His mother died when he was six. Ashe's small size helped him to decide on tennis rather than other sports in which his lack of height and weight would be a disadvantage. He began playing tennis at age seven and started training under Dr. Robert Walter Johnson of Lynchburg, Virginia at age 10. 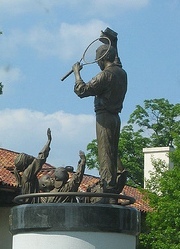 His tennis development in Richmond was limited by segregation laws that restricted him to African-American playgrounds. His senior year, he moved to St. Louis, one of the major tennis centers in the United States to improve his game under the tutelage of Richard Hudlin. In St. Louis, he attended Sumner High, where he was taught values that aided his character development by Olivia Merriweather Perkins. He had the highest grades in his class. Ashe began to attract the attention of fans after being awarded a tennis scholarship to UCLA in 1963. That year he was the first African American ever selected to the United States Davis Cup team. In 1965, Ashe won the individual NCAA championship and was a chief contributor in UCLA's winning the team NCAA tennis championship. While at UCLA, he was initiated as a member of the Upsilon chapter of Kappa Alpha Psi Fraternity. He graduated with a bachelor's degree in business administration in 1966. He joined the Army and became a second lieutenant. He won the U.S. Men's Clay Court title in 1967. Ashe quickly ascended to the upper echelon of tennis players worldwide after turning professional in 1969. By 1969, many tennis analysts considered Ashe to be the best American male tennis player. He had won the inaugural US Open in 1968, while still an amateur, and had aided the U.S. Davis Cup team to victory that same year. Concerned that tennis pros were not receiving winnings commensurate with the sport's growing popularity, Ashe was one of the key figures behind the formation of the Association of Tennis Professionals (ATP). 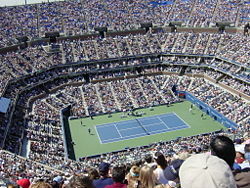 The Arthur Ashe Stadium in New York is the site of the U.S. Open tennis tournament. The year 1969, would prove even more momentous for Ashe when he was denied a visa by the South African government, thereby keeping him out of the South African Open. Ashe chose to use this denial to publicize South Africa's apartheid policies. In the media, Ashe called for South Africa to be expelled from the professional tennis circuit. In 1970, he added a second Grand Slam title to his resume by winning the Australian Open. After several refusals, South Africa granted Ashe a visa to enter the country in 1973, where he became the first black man to win a title—a doubles match—in the South African Open. In 1975, after several years of lower levels of success, Ashe played his best season ever by winning Wimbledon, unexpectedly defeating Jimmy Connors in the final. He remains the only African American player ever to win the men's singles at Wimbledon, the U.S. Open, or Australian Open, and one of only two men of black African ancestry to win a Grand Slam singles event—the other being France's Yannick Noah, who won the French Open in 1983. Ashe would play for several more years, but after being slowed by heart surgery in 1979, he retired in 1980. In his 1979 autobiography, the long-time tennis promoter and great player himself, Jack Kramer, ranked Ashe as one of the 21 best players of all time. After his retirement, Ashe took on many new tasks, from writing for Time magazine to commentating for ABC Sports. He also founded the National Junior Tennis League and served as captain of the U.S. Davis Cup team. In 1983, Ashe underwent a second heart surgery. To no one's surprise, he was elected to the Tennis Hall of Fame in 1985. The story of Ashe's life turned from success to tragedy in 1988, however, when he discovered he had contracted HIV from the blood transfusions he had received during one of his heart surgeries. He and his wife kept his illness private until April 8, 1992, when reports that the USA Today was ready to publish a story about his condition forced him to make a public announcement that he had the disease. In the last year of his life, Arthur Ashe did much to call attention to AIDS sufferers worldwide. Two months before his death, he founded the Arthur Ashe Institute for Urban Health, to help address issues of inadequate health care delivery, He was also named Sports Illustrated magazine's Sportsman of the Year. Ashe spent much of the last years of his life writing his memoir Days of Grace, finishing the manuscript less than a week before his death. He died of complications from AIDS on February 6, 1993. 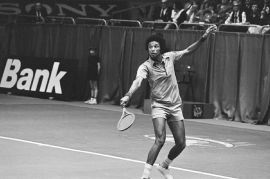 In addition to being one of history's greatest tennis players, Arthur Ashe was a pioneer who encouraged many young black people the world over to see tennis as a sport in which they could participate and excel. He helped end the whites-only policy of tennis at country clubs in the United States and was a major force in pressuring South Africa to end its policy of apartheid. It may be an exaggeration in terms of his talent to say that Ashe was to tennis what Tiger Woods is to golf, but in terms of the racial attitudes of the time, he was the more significant of these two great athletes. After his death, Ashe's body lay in state at the governor's mansion in his home state of Virginia. The last time this was done was for General Stonewall Jackson during the American Civil War. The city of Richmond honored Ashe's life with a statue on Monument Avenue, a place that was traditionally reserved for statues of key figures of the Confederacy. The main stadium at the USTA National Tennis Center in Flushing Meadows Park, where the U.S. Open is played, was named Arthur Ashe Stadium in his honor. This is also the home of the annual Arthur Ashe Kids Day. UCLA's Student Health and Wellness Center, opened in 1997, is likewise named after Ashe. In 1993, the sports cable television network ESPN created the Arthur Ashe for Courage Award as one of its ESPY Awards, presented to the sports-related personage or team judged to have made the most significant or compelling humanitarian contribution in transcendence of sports in a given year. In 2005, the United States Postal Service announced the release of an Arthur Ashe commemorative postage stamp, the first stamp ever to be featured on the cover of a Sports Illustrated magazine. Also in 2005, TENNIS Magazine put him in 30th place in its list of 40 Greatest Players of the Tennis Era. Official Arthur Ashe website. www.arthurashe.org. Arthur Ashe Institute for Urban Health. www.arthurasheinstitute.org. This page was last modified on 28 April 2016, at 16:06.